This is a recording of the PLANO sector sometime probably in 1995. 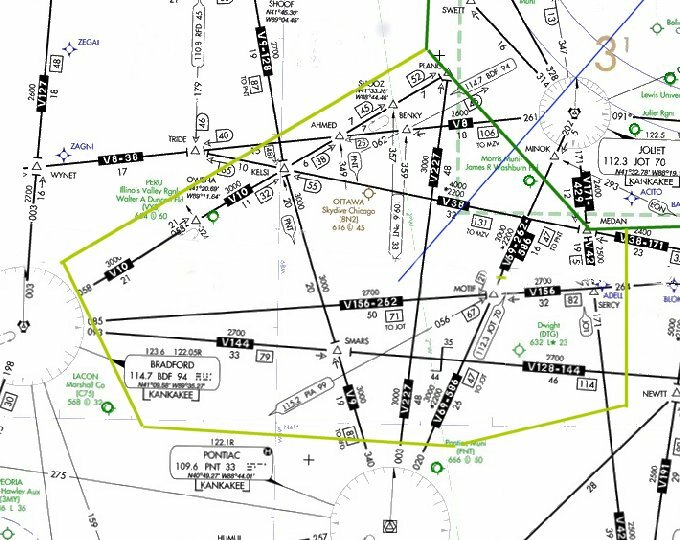 The airspace (described below) is a terminal feeder sector at ZAU (which is the FAA identifier for Chicago ARTCC) adjacent to ORD, sequencing arrivals to Chicago area airports from the Southwest. ORD was using runways 9R and 4R for arrivals, and it was sometimes convenient at this sector to vector aircraft for the 4R localizer (runway guidance signal) instead of the usual arrival gate which was seven or eight miles to the northwest. An arrival rush is in progress (and probably about 1/3 of the way through it) when the recording begins. The recording is about 19 minutes long and is in real time—nothing was edited. Although to someone unfamiliar with ATC recordings it may seem like a lot of nothing going on (with only six exceptions, all gaps are fewer than 20 seconds, however), at no time is a controller not busy in this type of rush. There are nearly 200 recorded verbal exchanges involving the controller in this 19 minute segment (and there were perhaps a dozen or more to the D-side controller to his right—not recorded), and in between there was constant monitoring, crosschecking, and planning going on inside his head. The control instructions, issued to put the aircraft where they need to be, to sequence arrivals coming in from different directions, transition aircraft to other sectors for further processing of the flight, and of course to separate airplanes, are just the audible component of what the controller is doing. In addition, each transmission made by the controller requires simultaneous marking of the appropriate strip—every one. The controller whose voice you hear is designated as ZAU. Controller voices from other facilities (ORD and PIA) are designated by their facility identifier. All air carrier type callsigns with the exception of Southwest, Vanguard, TWA 326, and Eagle Flight 141 are bound for ORD. TWA 326 is inbound to MKE and Eagle Flight 141 is inbound to PIA. Southwest and Vanguard were MDW arrivals. N198MA is inbound to RFD. Most of the airplanes coming from the high altitude sector feeding me (FL240 through FL330) were coming from the southwest over BDF, not far from PIA. TWA 254 and American 2026 were arrivals coming from the south over PNT, and needed to be sequenced with the BDF flights. Air carrier jets all have similar operating characteristics insofar as this type of session is concerned. Left to their own devices one could expect them to be at 320-350 knots coming out of High Altitude and have an operating envelope down to about 210 knots as they're turned over to Approach. Eagle Flight at the time was flying Jetstreams, Saab 340s, or ATRs (can’t remember), which operated at around 210 knots. Thus the conversation with ORD about staying behind EGF238 with the rest of the stream of jets. The point at which I was turning airplanes over to approach was about 35 miles from the airport, and it would have been difficult to pass up a Saab or Jetstream with very many (or any) 250 knot jets in that distance. In fact, I was merely anticipating what ORD customarily asked us to do at about that point and I had a natural gap I could keep for the Eagle Flight. 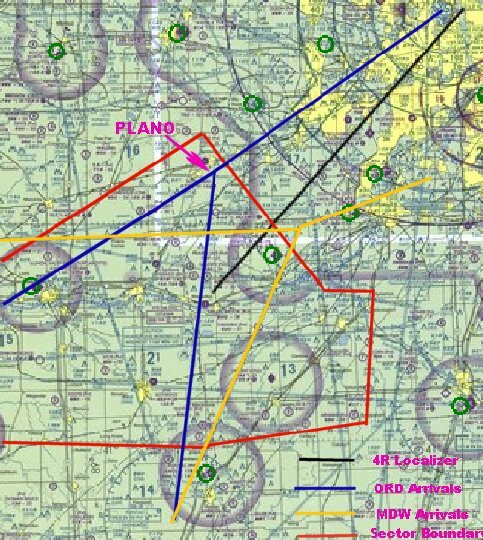 The airspace encompasses an area from just northeast of BDF to Aurora, IL, to JOT, down to just north of PNT, back to BDF. JOT is in my airspace from 14,000 and above, but belongs to ORD below that, to the ground. Vertically I have from 11,000 to FL230. Eagle Flight 238, because he was a relatively faster turboprop which I knew I was going to have to sequence anyway, would normally be worked by the sector below me which owned from the ground to 10,000. I coordinated with that sector to keep Eagle Flight on my frequency and ultimately to descend him to 8,000, the normal altitude for props to ORD. An identifier, such as PIA, not only identifies the airport but is frequently used to designate the ATC facility located there. Thus the references to PIA controllers or ORD’s airspace. The identifier in those cases has a secondary meaning. Its use and the distinction is readily understood in ATC, but might be confusing to visitors. In air traffic control, all altitudes are with respect to mean sea level (MSL). 10,000' near Miami is the same altitude as 10,000' near Denver—it's just that the ground is a lot closer in Denver (heights above ground level are referred to as AGL and don't have significance in separating airplanes). It is customary to issue a local altimeter setting (which changes based on barometric pressure) to aircraft operating at lower altitudes (below 18,000). “Flight Levels” are altitudes 18,000 and above and where all aircraft use a common altimeter setting of 29.92. They are simply the altitude as read from the altimeter expressed in hundreds of feet. Thus Flight Level 240 is 24,000 feet. When the local altimeter setting (atmospheric pressure) is below 29.92, Flight Level 180 becomes unusable (as it would then be less than one thousand feet from 17,000). Consequently, the interim altitude of Flight Level 190 was issued to a couple of aircraft because of traffic below them at 17,000.